The City of Minneapolis will station traffic control agents along Hennepin and Lyndale avenues near the Walker Art Center during the Monday afternoon rush hour to help keep intersections open and traffic moving, a city spokeswoman said. Gridlock developed Monday morning in the area near the musuem as commuters attempted to get around the closure of the eastbound I-394 ramp to eastbound I-94 by using city streets. But aside from the ramp leading from Hennepin Avenue to eastbound I-94, no huge traffic snarls developed on mainline roads during the first rush hour since the ramp leading from I-394 to eastbound I-94 was closed. Traffic on the proscribed detour route that sends drivers 15 miles along Hwy. 100, Crosstown and I-35W flowed well, the Minnesota Department of Transportation said. A few MnPASS users found out the hard way they could not get to eastbound I-94. They were forced into downtown and had to use exits at 12th, 6th and 4th Streets and Washington Avenue. Still that did not put noticiable amounts of extra traffic on downtown streets, said city spokeswoman Sarah McKenzie. 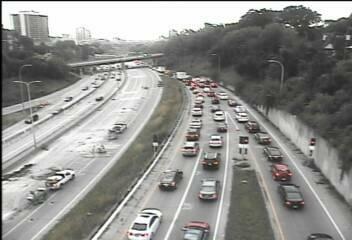 Gridlock developed around 7:45 a.m. on Hennepin Avenue between Dunwoody Boulevard and the split with Lyndale Avenue, and the ramp leading to eastbound I-94 backed up. But that was the biggest snarl on the system. "It's going as expected," said MnDOT spokesman David Aeikens just after 8 a.m. Monday. "People planned ahead and prepared and did a nice job working through it. It is only day one, however. People need to keep picking their routes and allow for lots and lots of time." The official detour takes drivers south on Hwy. 100, then east on the Crosstown and north on I-35W. That is a 15-mile detour. MnDOT shut down the downtown Minneapolis ramp from eastbound Interstate 394 to eastbound Interstate 94 that deposits traffic into the Lowry Hill Tunnel Sunday night. The ramp used by as many as 23,000 drivers a day will remain closed until Aug. 28. The I-394 ramp shutdown is part of a summerlong project along I-94 that spans 9 miles between Nicollet Avenue in Minneapolis and the Hwy. 252 interchange in Brooklyn Center. MnDOT is repairing more than 50 bridges and repaving and rehabilitating the freeway that was originally constructed in the 1980s. That project will run through October, but work in the Lowry Hill Tunnel will wrap up by mid-September.